Although the origins of MIMO spring from research dating back to the mid-1970s, the advent of the cellular phone networks demanded greater efficiencies in frequency use (and reuse). In 1996 Greg Raleigh, considered the inventor of MIMO, discovered that independent data streams utilizing co-located antennas and multi-variant signal processing could be efficiently transmitted by manipulating natural multipath propagation. With MIMO, multipath propagation is no longer an impediment; it’s necessary for the technology to work correctly. 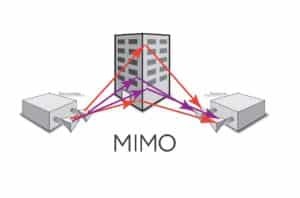 MIMO has proven indispensable to the evolution of wireless communications (e.g., WLAN, Wi-Fi, cellular) and now extends to powerline communication (PLC) protocols. The technology has been standardized for IEEE 802.11n, IEEE 802.11ac, HSPA+ (3G) and WiMAX (4G) networks. The three dimensional transmission mentioned above consists of frequency (the radio channel), time (bits per HZ) and space (multipath propagation). MIMO has been likened to 3-D computer graphics, which undoubtedly provides more input, communication and data content than 2-D. The flexibility of the technology allows for variants such as single-input, multiple-output (SIMO) and multiple-input, single-output (MISO) modes but the greatest efficiencies lie within the MIMO model. An aside: one may notice three numbers when dealing with MIMO networks, say 3x3x2. The first number is the number of transmit antennas, the second the number of receive antennas and the third the number of data streams. Researchers drool over MIMO because it’s the most efficacious means of maximizing wireless performance. 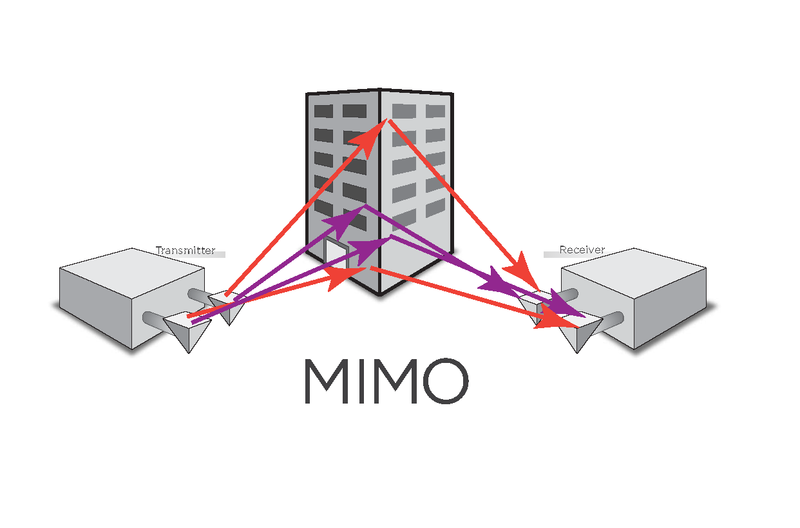 Rather than use techniques like channel bonding to add more bandwidth, MIMO receives and processes three (for example) separate signals “up the stack,” i.e., the top layers of network communication. This technique greatly improves the receiver’s ability to process data found in the RF. See the diagram below. Note that the “MIMO Processed Signal” is an amalgam of the three antenna signals. Spatial Multiplexing (SM or SMX) utilizes multiple source antennas to send individual separately encoded data transmissions, hence repeatedly multiplexing or reusing the multipath propagation dimension. Diversity Coding System a fault-tolerant method of transmitting data when channel knowledge is unavailable at the transmission source. Unlike precoding or SMX, a single data stream is transmitted using space-time coding. This method takes advantage of fading typically found in antenna array links to intensify signal variance and can be used in conjunction with SMX if the source transmitter provides some channel knowledge. SmartPhones, as one might expect, are an obvious application of MIMO technology. Since Precoding, SMX and Diversity Coding are complex transmission techniques, SmartPhones (and other portable wireless destination devices such as tablets) utilize the 4G LTE and HSPA+ standards to efficiently receive and process data streams. On the other hand, WiFi (e.g., IEEE 802.x) uses Orthogonal frequency division multiplexing (OFDM) or Orthogonal frequency multiple access (OFDMA) modulation for data transmission and processing. The IEEE 802.16e (Broadband Wireless) standard integrates MIMO-OFDMA; IEEE 802.11n (Wireless LAN) integrates MIMO-OFDM. Mobile radio telephone standards like the 3rd Generation Partnership Project (3GPP) and 3rd Generation Partnership Project 2 (3GPP2) also incorporate MIMO. Again, showing its native forward- and backward-looking flexibility, MIMO standards can be applied to both these competing technologies which significantly differ from each other, e.g. Global System for Mobile Communications (GSM) versus Code Division Multiple Access (CDMA). Another example of MIMO’s flexibility and utility of application is found in the the home networking standard ITU-T G.9963, which designates a communications systems over powerlines using AC phase, neutral and ground wires to transmit multiple data streams. Besides WLANs, mobile and cellular communication applications, MIMO is poised for deployment in metropolitan area networks (MANs) and digital television. It is truly a versatile technology and one that lives up to its hype. If you have 2 pipes connected to water supply, you’ll get more water. Add more pipes and get even more water. Same with MIMO; add more antennas and get (higher) data speeds. But every antenna and pipe comes at a cost and makes the arrangement more complex, so it’s an (accommodation) between cost and need. That’s MIMO in plain terms.